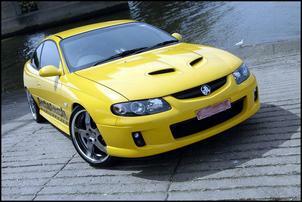 If you ever needed proof that marketplace competition is good for the average punter, take this Holden VZ Monaro CV8. Owned by Spiro of Sydney’s Autotech Engineering, this Munro never fails to knock people’s socks off with its APS (Air Power Systems) developed twin-turbo system. It’s what you call a competition crusher. From its cast exhaust manifolds to its moulded silicone hoses, this is the sweetest bolt-on turbo kit we’ve seen. Spiro purchased his CV8 brand new back in ’04 for the purpose of development and marketing. As an APS agent, Spiro knew the twin-turbo LS1 kit was in the pipeline and sought to make the most of it. A wise move! Appropriately named the APS Stealth Intercooled Twin Turbo, there’s not a lot to see when you pop the bonnet – some new (but OE looking) pipework, a relocated airflow meter and the absence of the factory airbox. Even when it’s staring you in the face there’s nothing to indicate the presence of 400kW at the wheels and double the factory torque output at around 3500 rpm! With the car up on a hoist, the picture becomes much clearer. The APS twin-turbo installation involves mounting the hairdryers down low alongside the chassis rails and behind the steering rack. This helps maintain relatively cool under-bonnet temperatures. But mounting the turbos this low does require some clever associated engineering. First, it’s impossible for oil to drain out of the turbochargers with a conventional gravity drain – oil can’t flow uphill into the sump... Instead, APS uses a dedicated oil recirculation pump (aka scavenge pump) which is mounted on the transmission between the two turbochargers. The second requirement – or, rather, safeguard – is the fitment of a protective tray that shields the turbo system from debris and smooths under-body airflow. In typical APS fashion, the kit employs a pair of cast iron exhaust manifolds which were tooled exclusively for the company. No bits-an’-pieces steam pipe here! The manifolds wear custom heat shields and bolt to Garrett ball-bearing turbochargers which are built to APS’s specification. These turbos are well suited to an internally stock engine but also give the flexibility to be used with a high-performance built engine. 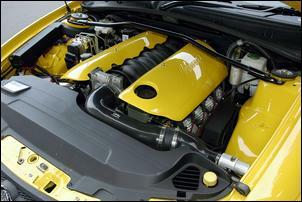 The intake to the turbochargers comprises twin pod-type air filters (mounted in the guard cavity) while APS leaves the exhaust system up to the individual. The Autotech car runs a twin 3 inch mandrel system constructed in stainless steel. With a twin-turbocharged V8 you’re talking a huge mass airflow – and that’s evident in the size of the APS air-to-air intercooler. The DR series bar-and-plate ‘cooler measures 540 x 250 x 150mm and is said to cause only a 1 psi pressure drop at an engine output of 675kW (flywheel). The intercooler comes with stainless steel piping, a high-volume twin-chamber blow-off valve and custom moulded silicon hoses. 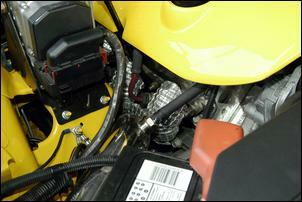 Interestingly, the standard airflow meter (including its internal screens) is maintained in the kit. The engine management system is tweaked and includes a UniChip interceptor for primary adjustment of fuel and ignition parameters. The fuel delivery system is upgraded with replacement injectors, twin 4 Bar pressure regulators and a surge tank arrangement with twin high-flow fuel pumps. With boost pressure set to around 9.5 psi, Spiro’s CV8 has no problem achieving 400kW at the wheels – and that’s the output almost regardless of ambient temperature. This is claimed to give quarter mile performance in the 11s – on street tyres! In addition, there’s a mountain of everyday useable torque at low revs and fuel economy is excellent (relatively speaking!). 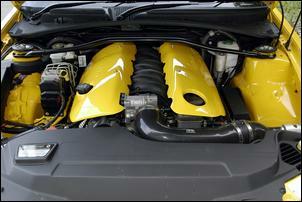 And, remember there’s nothing done to the internals of this mighty LS1. With around 12,000km on the odometer since fitment of the turbo kit, Spiro has had absolutely no problem with the car – although, excusably, the standard clutch is now starting to slip and is ready for replacement. The six speed ‘box and limited slip diff remain stock and are so far coping admirably. 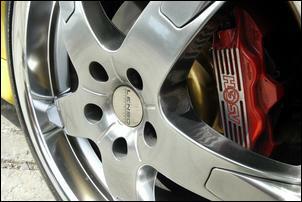 Thankfully, the brake system has been upgraded to HSV calipers running DBA slotted rotors. High performance pads and fluid are also employed. The Monaro comes as a pretty sweet handling vehicle outa the box but with twin-turbo grunt it's no surprise some extra tuning is required. Spiro's CV8 now sits flatter through corners thanks to Pedders springs combined with Bilstein dampers. Oh, and the wheels have also been upgraded to 20 inch Lensos wearing 245/30 rubber. Not surprisingly, the combination of a well engineered twin-turbo kit and a stunningly detailed promo car have proven successful in snagging customers. Since completing their Monaro, Autotech Engineering has installed at least ten of these kits to LS1 and LS2 powered customer vehicles. So you could say the Monaro has done its job! But it’s not going to go into retirement just yet. 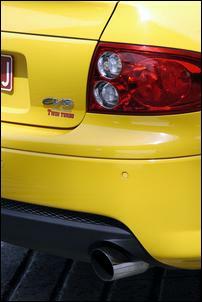 There are plenty of Holden/HSV drivers out there who crave performance but have not yet had the chance to experience the thrill of an APS TT system. 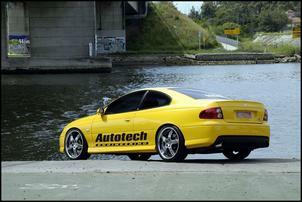 The Autotech Monaro will be hunting those people down!